World's best toothbrush. Clinically proven. Mechanical and sonic action: The advanced technology of the ultra speed arcuate action of the bristles removes dental plaque even beyond the tips of the bristles (US clinically proven). 1 minute of BROXO® OraBrush™ action corresponds 30 minutes of gum massaging by hand and 7 minutes of manual brushing to remove plaque. The result of 50+ years of research and development, the engine of the BROXO® OraBrush® delivers a powerful yet entirely smooth mechanical action through a high intensity perfecty sinusoidal axial oscillatory motion. Transmitted through the stembrush, this optimal mechanical action induces the ultimate sonic action beyond the tip of the bristles, disloging plaque even below the gumline. When applied to the gums, the unique action of the BROXO® OraBrush®, is unequaled in its massaging and strengthening effectiveness, resulting in a significant and sustainable gingival index improvement. BROXO® OraBrush®plaque removal index and gingival index improvement are better than twice as large as those provided by the next best available solution. The combined action of the BROXO® OraBrush® and the BROXO JET [kom.pakt] / BROXO® OraJets® have been clinically shown to stop gingivitis in 8 days and gum bleeding due to periodontitis in 30 days, restoring healthy gums. 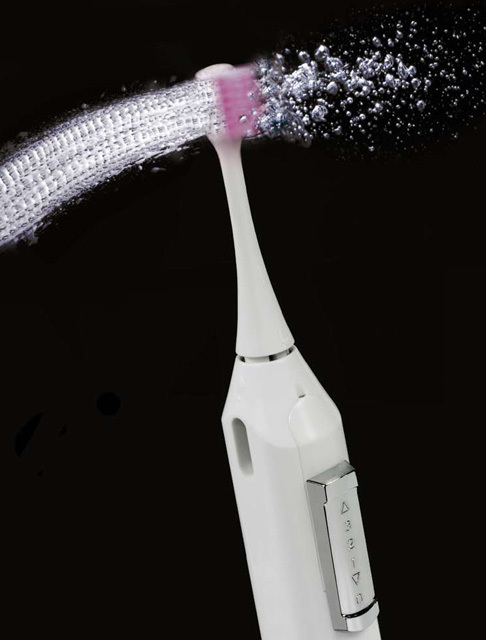 1 minute of brushing with the OraBrush is 30x more effective at reducing gingival bleeding and 20x more effective at removing plaque than 1 minute of brushing with a manual toothbrush. The batteryless design of the BROXO® OraBrush® guarantees that the full power is always available for the whole family. 4 personal toothheads are provided. Easy handling also encourages children to brush, and affords an excellent means of hygiene for people with physical impairments. The reduction of the 120 voltage to 14 volts is done at the outlet: the cord and the device are completely safe, and maintain the same brushing power regardless of the time and the frequency of use. 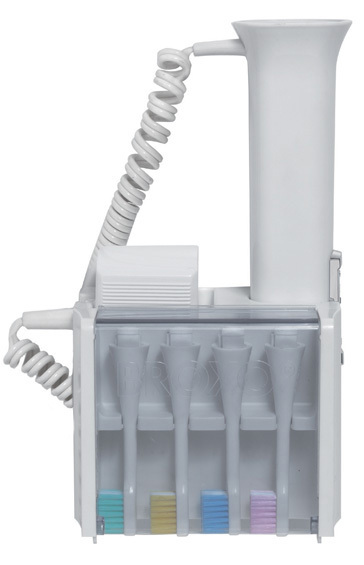 For overall health reasons, it was decided that no BROXO brushstem itself would never be equipped with an inside mechanism for moving bristles. Clinical studies (Pr. dr. Bonnaure-Mallet, at the School of Orthodontics in Rennes) have shown the creation of centers of microbe growth and risk of contamination in mechanisms placed within brushhead. The ends of the bristle fibers of the BROXO® OraBrush® are rouded and conform to the recommendations of the American Dental Association (A.D.A. ), in order to prevent any abrasive effect, either upon the dental enamel or upon the mucous membranes.